Hmm sounds interesting. What other issues do you think most vampire writers leave out or do not choose to elaborate on? Mine is the how. Most vampire writers fall back on magic or the super natural without given an explanation as to how their vampire powers work and how their vampire bodies differ from humans, like processing blood. I just got "Bite Me" in the mail today... I don't read a whole lot of YA, but the fact that Lola doesn't like being compared to Buffy makes it sound like it's worth the time to check it out. Grace the 'how' is a pretty iffy proposition. Using too much scientific rationalisation might take the story out of fantasy into science fiction. The best scientific explanation I have seen used for vampires is Lynsay Sands 'nanos'. In Bite Me the vamps are traditional. Magic works for me, but it is always great when an author finds a new twist on the old themes. Hey SQT, yeah the Buffy reference is pretty much a humorous nod to the character. Well then, do you think scifi vamps tend to be less interesting than fantasy vamps? Are there any in particular that stand out as being too fantasy or too scifi? PS: Was the Lindsay Sands reference Scifi or Fantasy? and does scifi rationalization have a tendency to take the "bite" out of vampire stories? Great review! I really dig the covers of these Bell Bridge books. I hope BITE ME finds a wide YA audience. I agree. 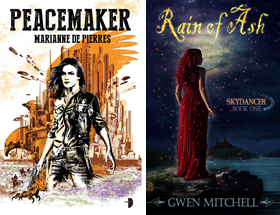 The covers set the books apart from the usual urban fantasy fair. Belle Bridge has a very talented group of YA writers. Hey Grace. The Lynsay Sands is an urban fantasy. Vampires are not really a subject addressed in scifi except perhaps for The Space Vampires by Colin Wilson, a story about alien psychic vampirism. And when reading fantasy you can't apply science or else you would end up criticizing the believability of just about everything. It's fun to see an author come up with an explanation though. Thanks. I’m with you, I enjoy a well thought out and believable explanation.